Pre-requisite Programs are considered the foundation of the HACCP Plan, which includes 5 preliminary steps and 7 principles. As consumers drive food safety expectations, risk assessment has become more stringent. Consumers demand that food manufacturers and retailers provide safe, quality foods. International standards and legal requirements mandate risk assessments as part of the implementation of a holistic Food Safety Management System. The goal of these three complementary risk assessments is to support risk management by identifying risks and applying appropriate preventive measures to protect public health. This article highlights the similarities and differences among the three assessments. HACCP is a systematic approach developed by NASA with the cooperation of Pillsbury and the US Army in the 1960s to prevent astronauts from contracting foodborne illnesses while in space. HACCP allows a multidisciplinary team to evaluate a food manufacturing process to identify potential hazards present that need to be controlled to ensure the safety of the food and prevent foodborne illness in consumers. These hazards are biological, chemical, radiological and physical. The team conducts a risk-based assessment for each step of the process, and identifies those points that are critical to control, reduce, or eliminate the hazard. Once these “critical control points” are identified, the team establishes monitoring procedures, corrective actions to be followed if there is a failure in the plan, verification processes and a record keeping process. 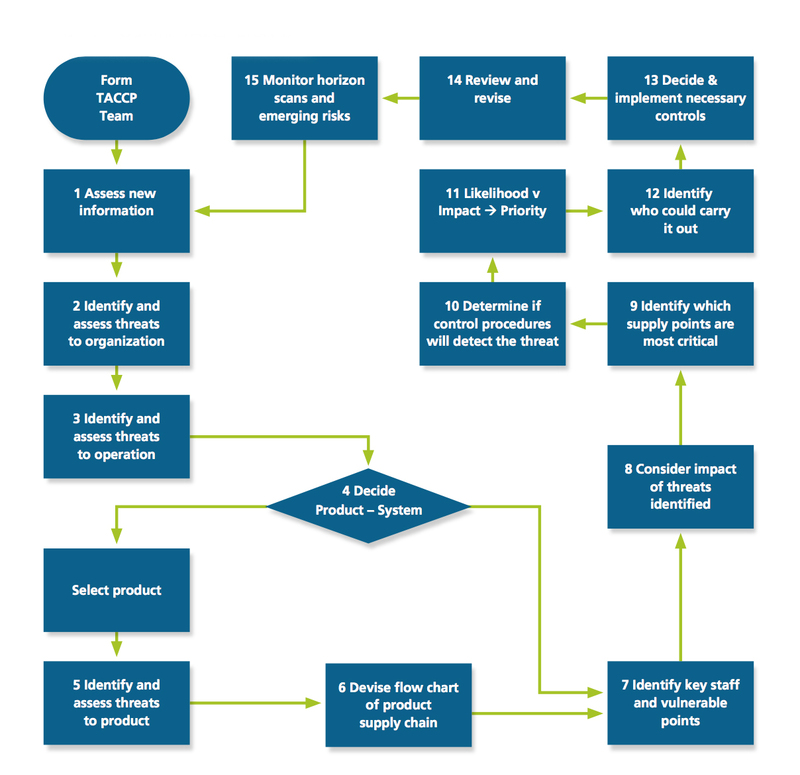 The Codex Alimentarius provides a 12-step process, as shown here, with five preliminary steps and seven principles. Completion of these steps results in the development of the HACCP Plan. In addition, the HACCP plan must be supported by Pre-Requisite Programs for basic compliance with regulatory and/or industry food safety standards, or it will fail to control the hazards. Formerly known as "food defense," TACCP has been recently introduced through the GFSI, and has become a requirement for some of the standards approved by this institution. TACCP is a management process, the main purpose of which is to identify threats within the food manufacturing process that could potentially result in an intentional, malicious contamination of the food by perpetrators attacking from the outside (external) or inside (internal). 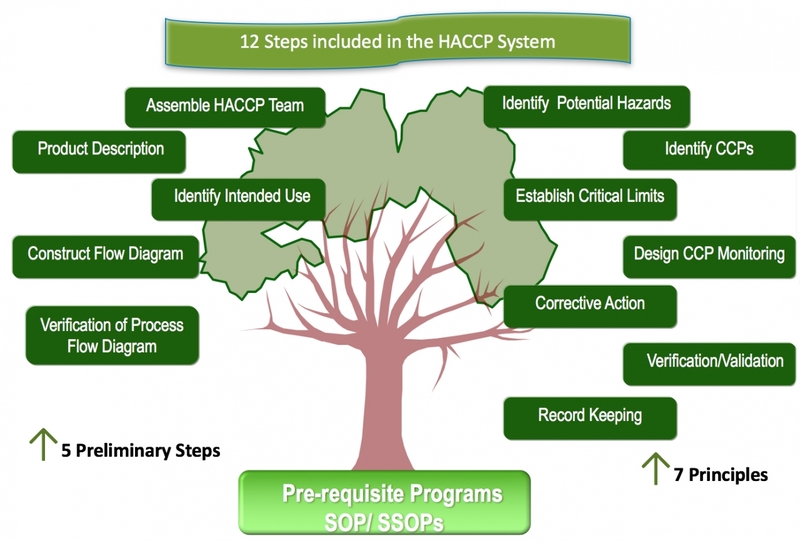 TACCP applies HACCP Principles to protect food and beverage products from attack. The Publicly Available Specification (PAS 96:2017) describes TACCP as a systematic approach to manage risk “through the evaluation of threats, identification of vulnerabilities and implementation of controls to materials and products, purchasing, processes, premises, distribution, networks and business systems by a knowledgeable and trusted team with the authority to implement changes to procedures.” Several threats need to be taken into consideration when performing a TACCP risk assessment. Just as in HACCP, the TACCP team is a multidisciplinary group of people that perform the risk assessment, identify threats, implement controls to eliminate or minimize the threats, develop corrective actions in case the plan fails, and establish verification and record-keeping processes. Once a TACCP team is formed, the TACCP process involves 15 steps. The Critical Control Points (CCPs) identified under TACCP are a moving target, and rely heavily on well written Pre-Requisite Programs that provide guidance on how to control the identified threats. Moreover, the GFSI Board of Directors now requires that all Standards approved shall include the following requirements to certify food manufacturers: 1) a vulnerability assessment performed; and 2) control plans in place. The entire Supply Chain must be considered during HACCP, TACCP and VACCP risk assessments. This includes, but is not limited to, agricultural activities, transportation, receiving materials, processing, manufacturing, storage, distribution, and retail market activities. Together, this trio of risk assessments provides the tools for building a food safety culture from farm to fork. Radojka Barycki is a Technical Training Manager working with the Food Safety Training team at SCS Global Services. Radojka can be reached at rbarycki@scsglobalservices.com, +1.510.851.0326. 1. TACCP: HACCP for threat assessments. Wayne Labs. Food Engineering. March 11, 2016. 2. VACCP: HACCP for vulnerability assessments. Wayne Labs. Food Engineering. February 17, 2016. 4. GFSI Direction on Food Fraud Vulnerability Assessment (VACCP) John Spink. 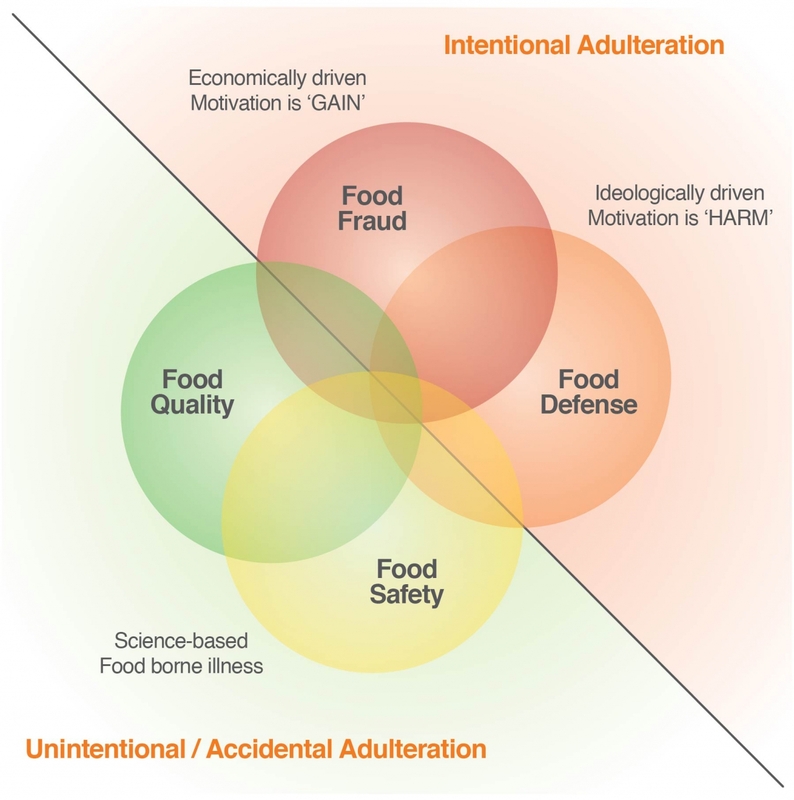 Food Fraud Initiative Blog. May 8, 2014. 5. GFSI Position on Mitigating the Public Health Risk of Food Fraud. July, 2014.